J.A.B. EXO’s dark mahogany brown rum coats the inside of my tasting glass with a syrupy looking smear that produces many thick, long-lasting legs. Pretty to look at, I suspect a sweetened rum … The nose is consistent with the eyes; aromas heavy with rich, sweet caramel and cocoa butter present themselves enticingly on the first sniff. Less pronounced scents of butterscotch, flour pastry, white raisins segue seamlessly to the flavors. That initial taste also brings a mild, sweet tobacco sensation and hint of vanilla to your palate, all riding on a heavy bodied splendid spirit. Of course, the finish is long, sweet, and tapers forever slowly. Anecdotes J.A.B. EXO was carefully selected by Juan A. Bacardi (yes, of that family), pictured below at right. Juan is the proprietor of Nassau's classy 1 ER•CRU, a retail tasting room of the finest presentation. Custom blended and sourced spirits are categorized by their origin: Rum - Sugarcane; Vodka - Potato, etc,) Pull up a chair and enjoy several of the J.A.B.-labeled discoveries – they're availble only at his store. The Nassau, Bahamas resident selected this rum from among a few single barrel rums of Trinidad Distillers Ltd. aged stocks. Its aromatic and flavor signature is pure Angostura pedigree, yet J.A.B. EXO is considerably richer and more refined than the vast majority of those rums. J.A.B. rum is bottled on Grenada by Westerhall Estate, which is also sources its fine rums from Angostura. Packaging is hefty and substantial, the same for all of Premier Cru’s wines and spirits. 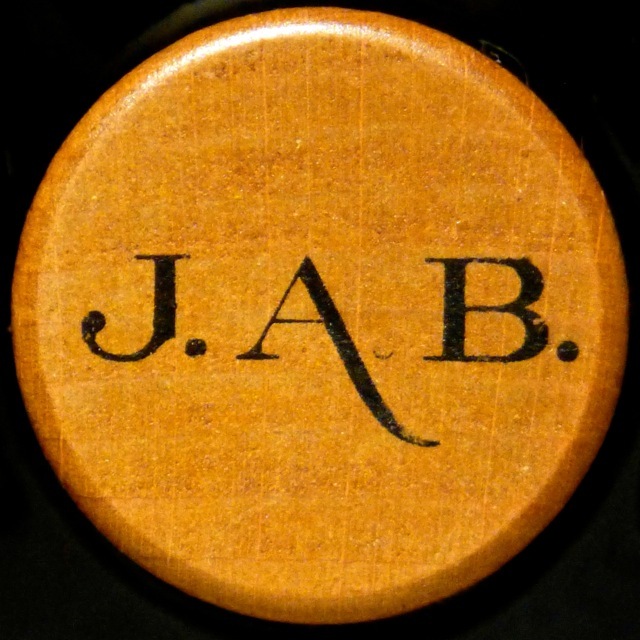 The bottle is simply labeled, with a classy wax emblem embossed with the initials J.A.B the only adornment. Those initials are also inked into the easily-grasped wooden cap. If sweetened rums are your preference, than you'll find J.A.B. EXO to be one of the finest tasting rums to come out of Trinidad Distillers Ltd. Thoughtfully held in check are the distiller's often overbearing molasses notes and vanilla bombs so characteristic of Angostura-labeled rums (1824, 1919). J.A.B. EXO exhibits tremendous flavor within that same style, but more harmonious, helped no doubt by the excess of added sugar. 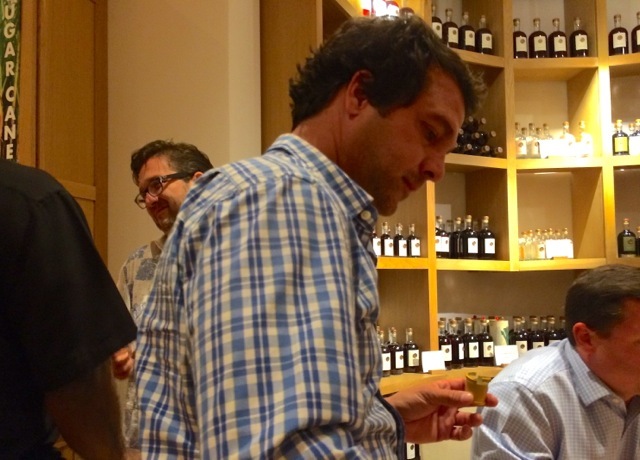 Reviewed: February-March 2015 at 1 ER•CRU retail tasting room while attending the Festival Rum Bahamas on Nassau, and again at The Rum Gallery, USA.